Just before 10 a.m. on Thursday, students began filling the common area of the Biological Sciences Learning Center between the spiral stairs and the front wall to see a new statue of Charles Darwin that was being donated to the University. The main reason why people came, however, was for the donor: James D. Watson, a Nobel laureate who contributed to the discovery of the structure of DNA in 1953 along with Francis Crick. Funding for the statue was originally given to Watson’s laboratory at Cold Spring Harbor Laboratory in New York to construct a statue of Watson. However, Watson decided to instead use the funding to build a statue of evolution expert Darwin, explaining, “I thought it wasn’t time yet” for his own statue. During the dedication, Watson discussed how his education at the University and former President Robert M. Hutchins shaped his approach to learning. “I am not politically correct because the function of intellectual inquiry should be rewarding the truth,” he said. Watson came to the University as a 15-year-old and made his monumental discovery 10 years later. Watson also commented that at peer institutions the role of genetics institutions involves a social theory element that detracts from pure science. He commended the University for ensuring that its research remains pure. 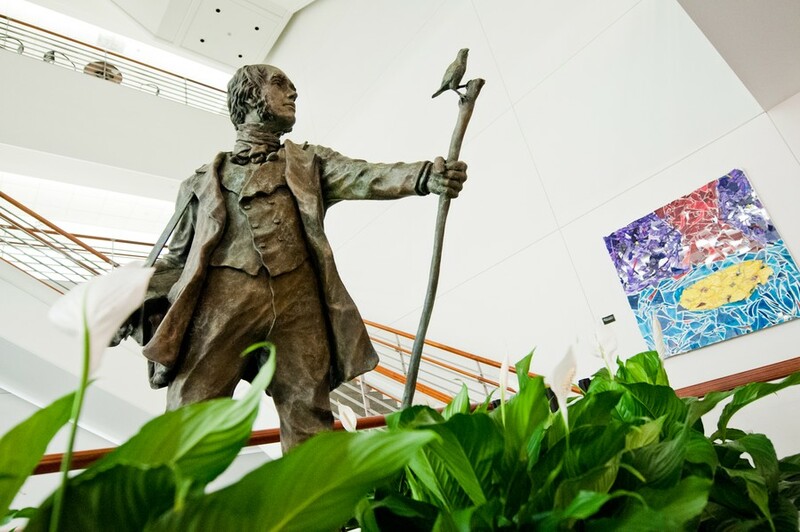 Robert J. Richards, the Morris Fishbein Distinguished Service Professor in the History of Science and Medicine at the University, spoke about the significance of the statue and Darwin’s work. He noted that the Galápagos canaries, like the one in the statue perched atop Darwin’s staff, are fearless; they will go out of their way to interact with humans while other animals will not. He compared the canaries to his ideal of a successful scientific researcher: daring and courageous.